The Bloods are a predominantly African American street gang that originated in South Central Los Angeles, California in 1972. The genesis of the Bloods street gang is traced to the intense street violence that consumed the city in the late 1960s and early 1970s. Much like their rivals, the Crips, the founding of the Bloods is steeped in legend and it is difficult to definitively construct a founding narrative. Most scholars believe that the Bloods were originally founded as a confederation of smaller gangs in opposition to the larger and domineering Crips gang. Those gangs included the Brims, Bounty Hunters, Denver Lanes, Athens Park Gang, Bishops, and, most prominently, the Pirus. At first, the Bloods appeared to be successful at repelling the Crips, but their rivals soon outpaced them in recruitment and dominated most of the 1970s gang warfare. The Bloods are distinguished by the color red, which they adopted in opposition to the Crips’ blue. Despite being outnumbered three to one by the Crips in the 1970s, the Bloods gained a reputation for being particular ruthless in their expansion and recruitment. Gang membership was often forced upon some young men in an effort to withstand the larger Crips organization. Much like their rivals, the Bloods organizational structure is best described as a loosely allied confederation of independent gangs or ‘sets’. These sets often have their own unique hierarchies with preference typically given to older gang members (Original Gangsters or OGs). The Bloods’ identification with other sets is perhaps best described not as an allegiance toward one another, but instead a mutual opposition toward the Crips. Also, like the Crips, sets of Bloods are almost as likely to fight each other as they are the Crips or other gangs. The Bloods expanded in the early 1980s when they became involved in the manufacture and distribution of crack cocaine. Some crack dealers were so successful that they could achieve previously unheard of levels of wealth reflected in luxury cars, expensive clothes, and opulent homes outside traditional gang territory. It was this appeal that partially led to the great expansion of the Bloods throughout the 1980s and 1990s. The tremendous wealth brought by crack also allowed the Bloods to expand out of Los Angeles and eventually eastward and northward. In the early 1990s, the East Coast Bloods, known as the United Blood Nation, were founded in Rikers Island correctional facility in New York, and soon expanded throughout the entire east. 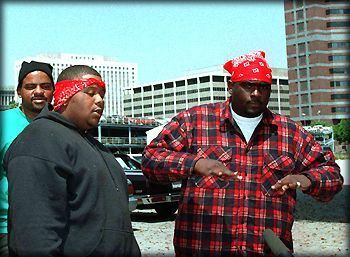 These Eastern sets, like the original West Coast Bloods, lack any allegiance to a central organizational structure. In 2003, National Drug Intelligence Center estimated that there were somewhere between 15,000 and 20,000 members who affiliated themselves in some way with the Bloods gang. Mike Davis, City of Quartz: Excavating the Future in Los Angeles (New York: The Alpine Press Inc., 1991); Gang Profile – Bloods (Washington, D.C.: National Drug Intelligence Center, 2003).